Back in 2008, DreamWorks Animation released their newest animated feature Kung Fu Panda, a tale that’s mixed martial karate, Chinese ascetic mythos, and hilarious cartoon frivolities. The movie, which was well received from critics and moviegoers, went on to gross over $630 million at box-office, became the highest grossing animated movie that year, and even garnished nominations for “Best Animated Feature” in both the Golden Globes and the Academy Awards. As if by a forgone conclusion, a sequel movie was inevitable and in 2011 Kung Fu Panda 2 was released. Surprisingly, the movie lived up to its predecessor (a feat that’s rare for a sequel to do) and further continued the karate-chop hijinks adventure of series character Po and his martial art companions; roughly grossing the same amount at the box office and receiving similar praise from viewers. After five long years, Po and his color characters return to the big screen for the next animated installment in the movie Kung Fu Panda 3. Does this sequel capture the same magic as the first two did or has the time come to retire this franchise once and for all? Having battled his way through villainous foes to martial arts supremacy, Po (Jack Black) is happily content to remain as defender of the valley, backed by the legendary Furious Five: Tigress (Angelina Jolie), Mantis (Seth Rogen), Viper (Lucy Liu), Monkey (Jackie Chan), and Crane (David Cross). However, Master Shifu (Dustin Hoffman) is ready for Po to learning the mystical ways of chi, giving the panda leadership responsibilities that frighten him, but also prevent his ascent to being a true Dragon Warrior. Adding more complications into this is the unexpected arrival of Li Shan (Bryan Cranston), Po’s biological dad, who’s come from a secret panda sanctuary to reunite with his long lost son, causing some parental anxiety from Po’s adoptive father, Ping (James Hong). At the same time, emerging from the spiritual realm is Kai (J.K. Simmons), a hulking creature that’s aided by jade warriors who wants to take control of all China, using his mastery of chi to imprison the sprits of legendary leaders, including Master Oogway (Randall Duk Kim). Probably besides How to Train Your Dragon (and its sequel), the Kung Fu Panda movies are my second favorite movies of DreamWorks Animation. The original Kung Fu Panda had it all. It had action, heart, humor, and a very stylish touch even for an animated movie. That’s why I loved it. It was so great and cinematically engaging that I forgot I was watching a CG cartoon movie. Kung Fu Panda 2 followed the same pattern, creating a sequel that was definitely worthy of the original film. Again, it had all the heart-warming and kung fu action fundamentals that made the first Kung Fu Panda great, while expanding its animated tale. When DreamWorks announced that they were going to make a third Kung Fu Panda movie, I was excited to see where the next chapter would go. However, I would have to wait roughly five years to see where that next chapter would go. Now, after seeing it, I felt it was definitely worth the wait. Kung Fu Panda 3 was an “awesome” sequel that (through its various nuances) closed its intended trilogy with style and grace. Kung Fu Panda 3 is directed by Jennifer Yuh, who previously directed Kung Fu Panda 2, is aided by co-director Alessandro Carloni, who also worked on Kung Fu Panda 2 as a story artist. Thus, Yuh and Carloni have an understanding of where to take the franchise in this third installment and indeed they do. Unlike the poorly-concieved animated cartoon spinoff Kung Fu Panda: Legends of Awesomeness, Kung Fu Panda 3 continues the franchise’s narration in an entertaining way, further continuing Po’s story of mastering the kung fu arts as well as keeping its thematic message of “being the best you can be” (a very insightful message for both kids and adults). Additionally, the story’s dynamics of family has always been present and is felt even more so in this installment. Pacing-wise, the movie doesn’t drag, which is a big surprise because that one of my biggest pet peeves when critiquing a feature, and action is fun and stylish, with a couple of scenes that are in 2D animation. As a side-note, while the movie’s comedy is spot on, its physical comedy and sight gags are just as funny as its vocal ones. However, they only problem I felt with this movie was that it was too repetitive in somethings, especially in Po’s story arc in mastering chi. While it’s an interesting concept (the spiritual realm of chi and its mysticism arts of Chinese mythos), it’s too similar and almost like a retread through Kung Fu Panda 2, which talked about finding and harnessing “inner peace”. However, that’s my only gripe with this animated tale and if liked the first two Kung Fu Panda entries then you won’t be disappointed with this one. Aesthetically, Kung Fu Panda 3 is absolutely beautiful and keeps up the stylish motif from the previous two entries. Immediately, I noticed (as I’m sure everyone else will to) that the movie’s animation is gorgeous and probably the best in the franchise as well as the animation studio’s catalogue of feature films. The character designs are detailed and the movie’s locales and environments are breath-taking, even for an animated movie. Adding to its visual representation, Kung Fu Panda’s 3 music is once again blissful to hear, thanks to the return of Hans Zimmer’s score. All in all, Kung Fu Panda 3 keeps up the precedent being very cinematic (in scope and scale) and I for one absolutely love it. Like the last two movies, Kung Fu Panda 3 has an impressive roster actors voicing its various characters, bringing back previous voice talents, while also adding some new ones into the mix. Once again, comedy actor Jack Black leads the charge in these movies as the loveable Po. 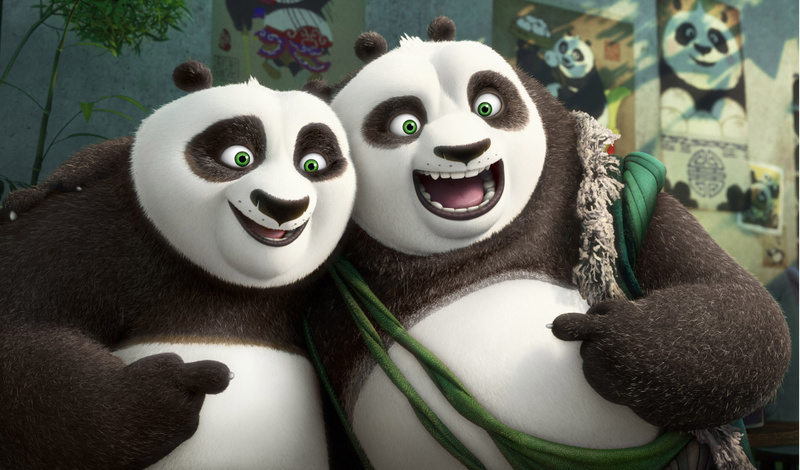 Black’s Po has always been the heart and soul of the Kung Fu Panda movies and this latest movie follows that same suit. It even goes without saying that some of the film’s best laughs comes from Black’s voice acting performance as well as character expressions. The Furious Five all return in this sequel and (much in the last movie) are more in the secondary characters / supporting roles. However, their voices, which includes Seth Rogen, Angelina Jolie, Lucy Liu, Jackie Chan, David Cross are still great and are solid throughout the movie. Other Kung Fu Panda veterans who return to their posts includes Dustin Hoffman’s Master Shifu, James Hong’s Mr. Ping, and Randall Duk Kim as Master Oogway, a character we haven’t seeing since the first film. Newcomer to the franchise is J.K. Simmons, who voices the movie’s villainous bad guy Kai. Kai, is an indeed an impressive foe and Simmons’s voice aids in that endeavor (whether in comedy or in villainy). He may not be the strongest villain in the Kung Fu Panda series, but Simmon’s Kai is still a worthy adversary for Po, proudly joining the ranks of Ian McShane’s Tai Lung, and Gary Oldman’s Lord Shen. Helping to bolster the newcomer voices is Breaking Bad star Bryan Cranston as Po’s long lost father Li Shan. Cranston delivers a solid voice performance in this role and does help add to the story’s dynamics (drama, comedy, and thematic message of family). Lastly, a more supporting role is the character of Mei Mei, a ribbon dancing Panda, who is voiced by Kate Hudson. While the character is funny and Hudson does deliver, I kind of have a feeling that Mei Mei was originally built (and meant) for actress Rebel Wilson, who original was going to voice the character, but then dropped out of the role. Interestingly, unlike other animated movies that have reached a third installment, Kung Fu Panda 3 has a more concrete feeling that this is the final chapter in the series, mostly wrapping up Po’s journey to becoming the legendary “Dragon Warrior”. While there’s space for further installments (which I hope they don’t do), I felt that this movie concludes the series on a very satisfying high note. Is Kung Fu Panda 3 good. Heck, yeah it is. This animated threequel of the DreamWorks franchise continues the tale of its loveable “rotund” hero that still as the signature look and feel from the first two movies, expanding on its narrative in way that sort of concludes Po’s journey in this cartoon trilogy. While some aspects are little bit repetitive from previous narration’s, the movie’s animation is beautiful gorgeous and cinematic, the story is fun and entertaining, and the voice-work is solid and top-notch. Personally, I loved Kung Fu Panda 3 as it was a great sequel movie to this animated franchise. Like live-action movies, animated sequels don’t have the best track records, but yet there are some exceptions. Kung Fu Panda 3 (like its second installment) is that exception and I highly recommend it to all, whether you love animated movies or simply have kids who like them. I got the 1st 2 movies for dirt cheap and watched them over the last couple of days. The 2nd one actually shocked me because of how deep it got got. The 1st was just mildly entertaining, but I honestly loved the 2nd and now my girlfriend and I will probably go out and see this one this weekend. Thanks for the review, it looks like it’ll be worth it! Hey, there. Thanks commenting and “following” my blog. Yeah, I feel the same way about these movies. The first one was good, but I found that the second one was better (couple of scenes in Kung Fu Panda 2 were pretty deep for a kids movie). Again, thanks for compliments and I just “followed” you site. Looking forward to your posts.